What you must ask your surgeon? Why is a dermatologist the best person for Mohs? 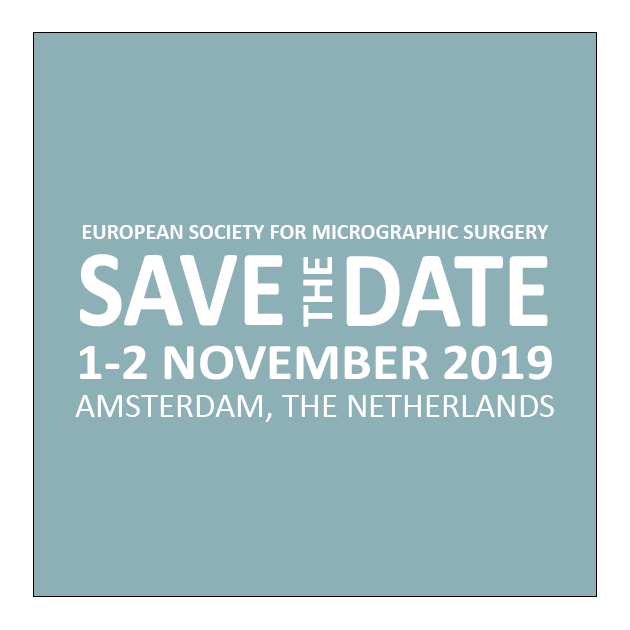 The course will take place 1-2 November 2019 at the Mohs Klinieken in Amsterdam, The Netherlands, and will be co-hosted by the Dutch Mohs Society. The course include extensive coverage of Mohs techniques, laboratory techniques, indications and reconstruction techniques. Furthermore, there will be several practical sessions, including live surgery demonstrations and group work with microscopy sessions, lab demonstrations and small group discussions about operative techniques. This year there will also be a 1-day Mohs (02 November) course dedicated to Lab Technicians. The ESMS is a group of European-based dermatologists dedicated to setting and maintaining professional standards in micrographic surgery for skin cancer, particularly the Mohs technique. There are various forms of micrographic surgery but Mohs surgery is the proven to be the most effective and advanced treatment for skin cancer today. It offers the highest potential for cure - even if the skin cancer HAS BEEN previously treated by another method. Mohs is a highly specialized skill which should be done by board certified dermatologists who have had rigorous training in this technique. Read more here about the technique and the dermatologists who do it. We are a sister society of the EADV (European Academy of Dermatology and Venereology), the main professional body or board certified dermatologists in Europe. ESMS position document on the use of Mohs micrographic surgery and other micrographic surgery techniques in Europe. This document has been conceived as a position document by leading European experts on MMS and MS who are members of the European Society for Micrographic Surgery (ESMS), describing details of the MMS technique, variations of MS and their indications from a European perspective. Any member in good standing of ESMS is welcome to register for the 2019 ACMS Annual Meeting, for member pricing. Members of the ESMS should register as a Non Member Physician and use the Discount Code ESMS2019 at the checkout. This should lower the amount due to the member pricing. Along with registering, please submit proof of ESMS membership to info@mohscollege.org. Once we have this verification, we will activate the registration. It is now possible to become a Lab Technician member.